Most laces are washable. To preshrink, hand-wash in warm water and air-dry. Even polyester lace can shrink. If you plan to dry-clean a lace garment, steam the wrong side of the lace with a towel underneath to prevent flattening design. Never touch lace with the iron. Hold iron 1/2 in. above the surface. 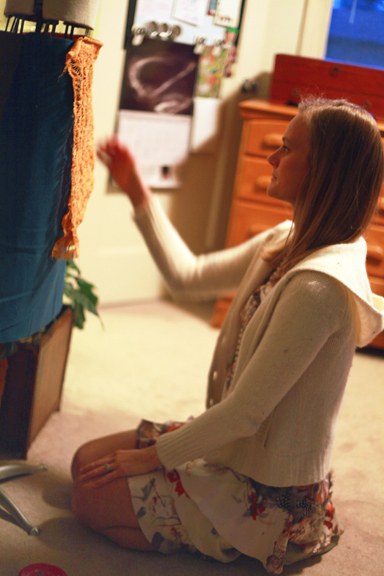 Store lace in a rolled towel. Next up: what to do about lace and darts? Amy…thank you for the lace information. I have been looking at lace…so far just looking, but I didn’t know or think that it would shrink. However you decide to use it on your skirt, I’m sure it will be pretty. Half the fun of sewing is planning! Since I haven’t worked with much lace in the past, I can’t speak to what laces in general will do. All I can say is that this orange lace shrunk when hand washed and that I wish I hadn’t been such a penny pincher and ordered a bit more! So far, so good with my new plan, but I haven’t gotten to the tricky part! Hahaha….sounds like me with my husband!! A pencil skirt would be really cute…go for it! Thanks! Hopefully it’ll work out! Yep, there’s a blue there. It was meant to be more emerald, but the longer I look at it, the darker it gets! Did you find that preshrinking the lace changed the hand or look of the fabric? I’m surprised that even polyester lace shrinks – that’s good to keep in mind! I laid it out flat to dry. Afterwards I noticed that it had a few bubbly places where it probably got bumped while drying (I blame the cats! ), but I worried about ironing them out based on Sandra’s recommendations. Thankfully, it’s since regained its original shape. Wow, the thought that lace could shrink had never crossed my mind. I could understand cotton lace (if there is such a thing) but polyester… huh? Thanks for the tip! Phew! Thanks for posting in the nick of time, I’m about to buy an awful lot of lace for a circle skirt overlay…and might have cried if it had shrunk! There was an article by Susan Khalji years ago in Threads that talked about how to handle the darts issue in a lace skirt. I was planning to look it up because I have some heavy natural color lace for a skirt. I’ll let you know if I find it. Ooh good luck! I always hate/love when my fabric shrinks up more than expected. I hate it for the obvious reasons (all my plans! dashed!) but sort of love it for the problem solving that ensues. I’m sure you’ll come up with a wonderful solution! I always pre-shrink all my fabrics, even if they claim to have been pre-shrunk. I often find they shrink anyway. For darts in lace, I tend to make them in the normal way, then trim right back and bias bind with either an organza bias strip, or a satin bias tape. If you play with different bias tape colours you should be able to find one that works. You may decide to match it to the lace colour or the underlying fabric (or flesh tone if there is none), depending on the density of the lace pattern. I should say that when I made a similar pencil skirt last year (black lace over a dark red taffeta), I used some of the taffeta to make the bias binding. I have a bias binding foot and an old Singer bias guide (it fits to the scissors), which makes it all really easy to do. You can easily cut similar strips (on the true bias) using your rotary cutter and a ruler, as I’m sure you know! Interestingly, for this dress Gertie treats it as one fabric, having basted the two together. I couldn’t do that with mine as the outer layer is a different shape, intentionally, and it wouldn’t move right. Good to know! I’m planning to underline my lace so I’ll just baste together the center of the darts and stitch them normally. What did you decide to do about them?